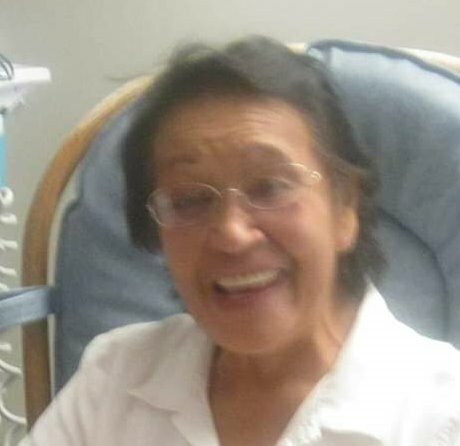 Almeda Rose (Lussier) Strong, age 81, of the Bear Clan and Redby, Minnesota went home on Monday, November 12, 2018 from the Sanford Hospital in Bemidji, MN. She was born on December 18, 1936 to Isdore and Rose (King) Lussier. Almeda was born and raised in Red Lake. She attended the St. Mary Mission and Red Lake High Schools. After graduation she went attended the Haskell Institute in Lawrence Kansas. Almeda graduated and met Pete Strong, Sr. They married and had four beautiful children, Clayton, Lennette Rose, Winona Jean and Peter James. Almeda worked many various jobs throughout her life. She worked for Comp Health for more than 20 years before working as the Director of the ENP. She was the Gift Shop Manager at the Red Lake Casino and also worked at the Seven Clans Casino in Thief River and the Head Start Program in Red Lake as a cook. Almeda went back to school so that she could learn how to care of children with special needs and became a Special Education Teacher’s Aide for the Red Lake School District. She loved music and was an amazing dancer. Almeda enjoyed sports, going to the casino to play bingo and keno. She loved to cook and looked forward to cooking for her family and friends. Family that Almeda is reunited with are her parents; Isdore and Rose, daughter Lennette Rose Strong, brother; Wishie Thunder, grandchildren; Peter William Strong III and James Robert Dudley, Jr., great grandchildren; Aiden Harvey Strong, twin boys Dee and Carmen and Gavin LaDuke. She leaves behind to cherish her memory her children; Clayton (Luanne) Strong, Sr., Winona (Jim) Dudley and Peter (Mary) Strong, Jr., siblings; Thelberta Lussier, Barbara Vasquez, Doyla Lussier, Jackie DeFoe, Lamonte Lussier and Joseph Thunder, grandchildren; Stephen, Clayton Jr., Floris, Floyd, Ron, Joe, Harrison, Derek, Rick and Dillon, great grandchildren; Sean, Shane, Chase, Amera, Miles, Clayton III, Kiana, Jerell, Lilah, Jayla, Ramena, Kachine, Patrick, Silas, Lorna, Harrison Jr., Robyn, Garrick, Arianne, Aaliyah, Paige, Aries, Tyrell, Andrew, Raelee, Areyanna, Nakiah, Sheanna, Tayvon and Ahniyah and one great great-granddaughter, many nieces, nephews, cousins, other relatives and friends. An overnight wake for Almeda will begin at 11:00 a.m., Thursday, November 15th and continue until her 2:00 p.m. funeral service on Friday, November 16th all being held at the New Redby Community Center in Redby, MN. Father Jerry Rogers will officiate. Pallbearers for Almeda will be Joe Strong, Floyd Strong, Derek Strong, Jamie Auginash, Garrick Lawrence, Stephen Strong, Justin Auginash and Frank DeFoe. Alternate pallbearers are Ron Strong and Dillon McBride. Her honorary pallbearers are Floris Strong, Elaine Johnson, Marilyn Jones, Carolyn King, Flower King Sherilynn King, June Holstein, Renae Cook, Arianne Strong, Misty Sumner, James Dudley, Sr., Mike White, Harrison Dudley, Sr. and all her nieces. Interment will be in the St. Mary’s Catholic Cemetery at Red Lake, MN following her services.